The not unreasonable hypothesis that style, taste, fashionable living and invention shaped the 400 years between 1500 and 1900 is at the heart of the stunning new British Galleries at London's Victoria and Albert Museum. Spread over two floors, this exhaustive exhibition presents interior living styles from Renaissance to Arts and Crafts, examining how things looked in terms of their form and decoration, who shaped and influenced design, how new habits and lifestyles linked with design changes, and how innovation affected choice and availability. Room sets give a feeling of how life was lived by those wealthy enough to afford such fine items, and interactive style guides help with identification of characteristic shapes and motifs. explains through a mix of well-chosen pieces and related texts how craft skills developed from the comparatively crude workmanship of the early years through to the precision needed to properly portray, for example, the disciplined Palladian style. Sadly, this permanent exhibition also shows that by the end of its time span technological advances had led to a virtual end to handcrafts - except as practised by members of the Arts and Crafts movement. The permanent show begins with the Renaissance when a revival of interest in the art and culture of ancient Rome included such decorative features as masks, heads in roundels, grotesques (plants and fantastic creatures copied from Roman wall paintings), strapwork, moresques (flat, scrolling patterns derived from Islamic art and also known as arabesques) and bunches of fruit and flowers. 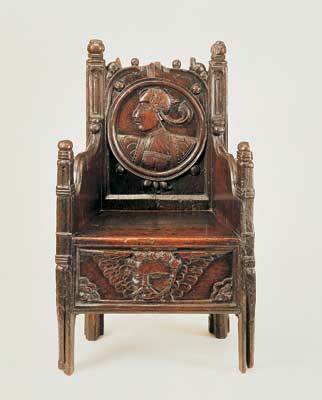 A bedpost dating from around 1520 and a chair displaying a female head in profile, from around 1540, encapsulate the rough-hewn character of the workmanship. One of the biggest single pieces is The Great Bed of Ware, lavishly embellished with carving to complement the hangings which turn the space within into a cosy room. The four-poster - legend has it that it once slept 26 butchers and their wives - was 'furnished' with an ornately carved wooden 'ceiling', arches carved from panels to represent windows, a satyr to signify lust - though with so many in the bed at any one time it's best not to dwell on that picture too long - lions and swans. Books being in short supply still, the graffiti and wax seals added by tourists might also have been enjoyed by the occupants. 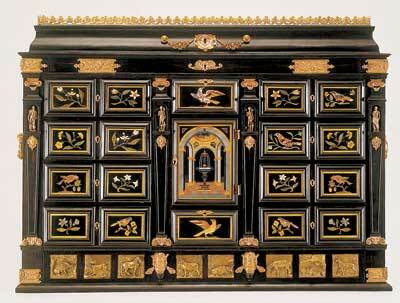 The colourful Jacobean period between 1600 and 1625 was reflected in the furniture of the nobility. Carvers produced high relief and incised lines to combine motifs that were probably based on engraved prints. A panel shows the face and figure of a Muse with a stringed instrument. An oak draw-table from the start of the century is inlaid with sycamore, holly and bog oak and features huge turned bulbous legs lavishly but crudely carved with acanthus leaves. The start of the Restoration period in 1660 triggered decorative and stylistic advances which for carvers meant a return to nature, with tulip, rose, sunflower and fruit motifs. By this time furniture wasn't always produced for comfort and use, and richly carved 'Sgabelli' Italian-style armchairs of slightly gilded oak and beech would be placed against walls in formal palace rooms to be admired rather than sat on. As house interiors began to be divided up into designated room spaces from about 1550, so furniture became more sophisticated, with simple refectory tables, 'cup-bordes' and stools giving way to ornate cabinets, tables and chairs. At around the same time the cane chair came into being; it was lighter, cheaper and easier to clean than chairs with fixed upholstery. Plain it was not, bearing carved foliage and scrolling on the front stretcher and cresting at the top of the back display. The development of dovetail joints meant chests of drawers largely replaced lidded chests. These were likely to be of oak ornamented with cherry, bog oak, ebony, ivory, snakewood, brass and mother-of-pearl, and to feature turned and carved columns. At around the same time, in 1657, the invention of the pendulum by Christian Huygens led to the introduction of the first longcase clocks - and more opportunities for increasingly skilled carvers and turners. Craftsmen were required to make such specifics as wassail sets in basket-weave pattern from lignum vitae and ivory with silver trim, sitting on a table and stand on turned legs bisected by ivory spheres. Pine mirrors and picture frames were becoming ever more ornate, with one dated 1665-1672 sporting scrolled foliage and putti (winged infants) in Restoration style. Traces of glaze and gilding show that the foliage would have been silver leaf and the putti would have been flesh-toned. A set piece called The Stoning of Stephen (1680-1710) could well have served as carver-extraordinaire Grinling Gibbons' portfolio. Made early in his career, it demonstrates his virtuosity, using limewood and lancewood with some later paint to show his capabilities in representing a tempestuous sky, a basilica, a tree dripping with foliage, and complex figures. Towards the end of the 17th century the exuberant Baroque style crossed from the Netherlands and the Palace of Versailles in France. The French designer Daniel Marot established the idea of a unified interior in which the decoration, furniture and furnishings co-ordinated. By 1715 Baroque was giving way to Palladianism, based on the four classical columns (Doric, Ionic, Corinthian and composite) known as the Orders of Architecture. Adhering to classical principles of balance and symmetry meant carvers had to obey a fixed hierarchy of ornamentation and have a repertoire of motifs like acanthus leaves and masks. Not averse to using a man-made therefore cheaper material, a marble table top might have been formed from scagiola - the 18th century's Corian, as seen in a side table which sits on a base designed by Henry Flitcroft and bearing fruit, shells and a phoenix. The exterior formality of a Palladian-style house would more than likely have been filled with flamboyant Rococo style, giving carvers a chance to demonstrate dynamism and fluidity. This organic approach is seen wonderfully in a design of a chimney piece and overmantel as one unit. A candlestand shows the full range of Rococo motifs formed from naturalistic carved branches and dolphins supported on a base of scrolls, with rocaille and dripping water motifs, probably designed by Thomas Johnson and made in his Soho workshop. Meanwhile, domestic furniture was also borrowing from the Gothic style of religious and civic buildings. By the second half of the century, however, the Neoclassicists were holding sway, taking their inspiration from Ancient Greece in a style introduced by Robert Adam, William Chambers and James Stuart, three young bloods who had studied architecture in Rome. For carvers, their designs necessitated plain, cleanly carved perpendicular lines imitating Greek temple columns, and restrained swags. Exterior shapes were brought indoors with Adam's breakfront bookcase featuring a central pediment and supported by pilasters of the Ionic order. The manufacture of furniture to a particular design probably began with Thomas Chippendale and his The Gentleman and Cabinet-maker's Directory of 1754. This became highly influential at a time when cabinetmakers were finally taking over from upholsterers in controlling the furnishing of houses. No doubt with an eye to the main chance, Chippendale's designs covered Gothic, Rococo and Chinoiserie, and later took in Neoclassical too. Carvings from his workshops were crisply cut and lively. The 19th century was ushered in by Regency Classicism which combined Greek and Roman design with contrasting elements taken from nature, ancient Egypt, Rococo and the Empire style of Napoleonic France. A bergere, for example, has bold, simple and chunky lines and is decorated with an egg-and-dart pattern at the top of the legs, small rosettes and curling gilded acanthus leaves around the base of the seat. 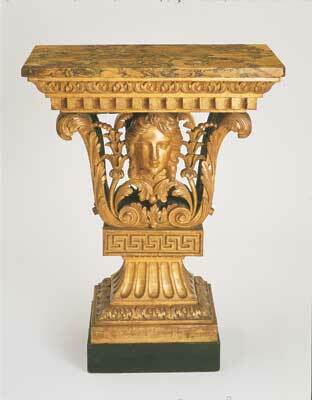 The gilding looked impressive on the dark mahogany, rosewood and zebrawood favoured for Regency furniture. The Victorian era was marked from 1830 to 1880 by the Gothic Revival, featuring furniture that was simple in shape and construction but highly decorated. It was punctuated by Aestheticism or 'art for art's sake' from 1870 to 1900, when peacock feather and sunflower motifs provided colour in the earnest Victorian world. Gothic predominated, however, as seen in a Romanesque-style wardrobe resembling a Norman doorway, elegantly carved in oak in a mainly geometric pattern with some figurative work at the top of the central arch. Victorian Gothic is exemplified by the contrasting work of William Burges whose inventive and colourful designs were often inspired by 14th-century French cathedrals, and the architect Augustus Pugin whose more sober ideas influenced the churches that were being built in response to the religious revival of the time. A Pugin-designed cabinet shown in Paris in 1855 required the work of more than 40 craftsmen, but while the highly decorative Gothic Revival had put the carver in great demand, this was not to last. Increased industrialisation led to a reduction in the need for handcraft skills and ushered in an era of plainer furniture. Salvation of a limited extent was offered by the Arts and Crafts movement founded by William Morris and friends on the principle that decoration should reflect the method of making. Factory-produced furniture, however, was never going to be able to reproduce a design like Charles Voysey's oak desk with decoration confined to its applied copper hinges, and the rest, as they say, is history. Only now are we seeing a return to the recognition that craft can be art. "Carvers produced high relief and incised lines to combine motifs that were probably based on engraved prints"